No More Champagne: Churchill and his Money tells the fascinating story of Churchill’s lifetime of tangled personal finances. Meticulously researched by a senior private banker now turned historian, it reveals for the first time the full extent of the iconic British war leader’s private struggle to maintain a way of life instilled by his upbringing and expected of his public position. Lough uses Churchill’s own most private records, many never researched before, to chronicle his family’s chronic shortage of money, his own extravagance and his recurring losses from gambling or trading in shares and currencies. Churchill tried to keep himself afloat by borrowing to the hilt, putting off bills and writing ‘all over the place’; when all else failed, he had to ask family or friends to come to the rescue. This they did on no fewer than six occasions unearthed by Lough, the last when Churchill became Prime Minister in 1940. Yet within five years he had taken advantage of his worldwide celebrity to transform his private fortunes with the same ruthlessness as he waged war, reaching 1945 with today’s equivalent of £3 million in the bank. His lucrative war memoirs were still to come. Throughout the story, Lough highlights the threads of risk, energy, persuasion and sheer willpower to survive that link Churchill’s private and public lives. He shows how constant money pressures often tempted him to short-circuit the ethical standards expected of public figures in his day before usually pulling back to put duty first - except where the taxman was involved. "David Lough, an Oxford historian now in the world of finance, has charted the hitherto little known and sometimes heroic saga of the Churchills’ struggle to achieve liquidity. He is a courteous guide, whose knowledge of the arcane world of investment (and its pitfalls) enables him to explain what went wrong and how Churchill managed to scrape through. The result is a fascinating read, although an unnerving one for anyone who has the tastes and appetites of Mr Toad and the income of Mr Rat." "Debut author Lough, an investment advisor, succeeds beyond any reasonable expectation in making this unique chronicle of Winston Churchill’s money problems fascinating, even for those with limited interest in financial matters… Lough’s detailed, but fast-moving, narrative succeeds in making one of British history’s most prominent men more relatable; as Lough notes, “it is salutary to discover that one of the most successful political figures of the 20th century ran up huge personal debts, gambled heavily, lost large amounts on the stock exchange, avoided tax with great success, and paid his bills reluctantly."" "This excellent and entertaining work is worth reading for the lists of more than 1,000 bottles of champagne and 250 bottles of brandy that Churchill got through in 1949 alone. " "Brilliantly illuminates one of the few unexplored aspects of Winston Churchill's life." "Opens up new insights into the life and lifestyle of Britain's most famous 20th-century leader." "Minutely researched and richly enjoyable." "This excellent and entertaining work is worth reading for the lists of more than 1,000 bottles of champagne and 250 bottles of brandy that Churchill got through in 1949 alone." "This is the first biography to focus on Churchill’s business affairs. To view someone from just one angle is usually to deform them, but David Lough, drawing on compelling material including Churchill’s tax records, more than justifies his audit." "Churchill as financial risk-taker, spend­thrift, debtor, reckless gambler. This book makes you wholly rethink the received wisdom about the icon." "If the revelations contained in this book about Winston Churchill’s personal finances had been common knowledge in 1940, he might not have become prime minister. For what David Lough shows in compelling detail is that the political risk-taker, who had notoriously described the disastrous Dardanelles expedition as ‘a legitimate war gamble’ was even more reckless in private than he was in his public life. " "Lough deserves high praise for bringing together disparate sources of information and making sense of them, and so providing the first integrated account of this important aspect of Churchill’s life. He also organizes the material in an easy-to-understand way and writes beautifully. The book reads as effortlessly as a novel,..David Lough’s No More Champagne may become a classic. It will transform the way that Churchill is interpreted and understood. Any bids for the film rights? " "fascinating…a remarkable story of flamboyant improvidence. Admirably researched and told with eloquent restraint." "Brilliant and compelling …fantastic, fun and informative…the book’s real value can be found in what it reveals about Churchill…exposes the reader to completely new elements in Churchill’s thinking which have remained largely untouched by biographers and historians ." "Lough draws out subtle private meaning from scrutinised private means, eventually accounting for the statesman in full - colourful but constrained, idealistic but enmeshed, a man always partway between Destiny and his bank manager. As well as being unexpected, No More Champagne is also an understated triumph of the biographer’s art - an acutely English appreciation of a great Englishman present as everything altered, a prisoner of circumstances as much as a shaper of things to come." 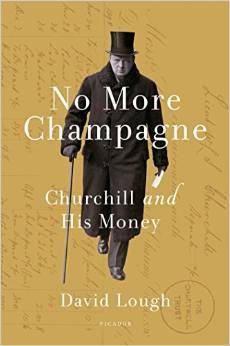 David Lough’s No More Champagne: Churchill and his Money has been optioned by Carnival Films. UK & Commonwealth rights in an edition of Winston Churchill’s correspondence with his mother have been sold to Head of Zeus. Darling Winston: My Dearest Mama edited by David Lough, whose last book No More Champagne: Churchill and his Money was shortlisted for the History Today Award, will be published next year. 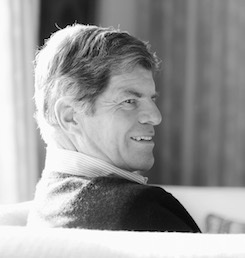 In this new video, author David Lough talks about Churchill’s tangled personal finances, the subject of his new book No More Champagne. The historian Roger Crowley promises: “a long-range epic of navigation, trade and technology, money and crusade, political diplomacy and espionage, sea battles and shipwrecks, endurance, reckless courage and extreme violence”. His pulsating narrative does exactly that. He is a courteous guide, whose knowledge of the arcane world of investment (and its pitfalls) enables him to explain what went wrong and how Churchill managed to scrape through. The result is a fascinating read, although an unnerving one for anyone who has the tastes and appetites of Mr Toad and the income of Mr Rat.